The immediate ancestor of the Toy Fox Terrier is the larger Smooth Fox Terrier. The original Fox Terrier breed standard was written in England in 1876. The size of the breed at that time was 18 to 20 pounds. Owners of these brave little dogs found that the smallest, which they called "runts", were the scrappiest of the bunch. These little dogs were prized for their temperament. Smaller dogs were developed and eventually were found in the seven pound range. 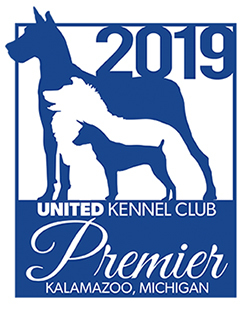 The United Kennel Club began registering the Smooth Fox Terrier in 1912. 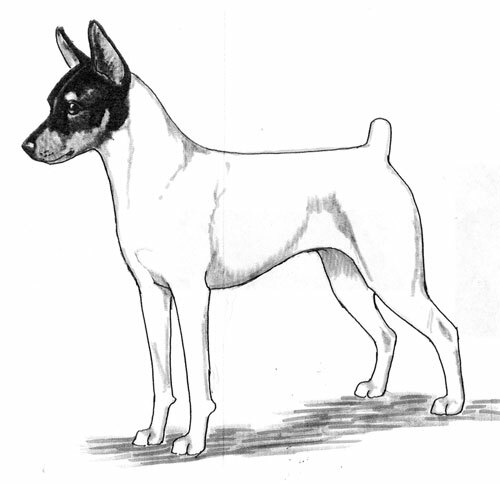 Between then and the mid 1920's, the Toy Fox Terrier was developed, being a miniature of the previous breed, however they were still registered under the name of Fox Terrier (Smooth). Those dogs appear almost identical to the dogs of today. It was not until February 24, 1936, that U.K.C. began registering the Toy Fox Terrier under its current name. The Toy Fox Terrier is self-possessed, spirited and determined. They are energetic, lively and strong for their size. They are not easily intimidated by other pets. Most are comical, entertaining and playful all of their life, which is generally long in comparison to many other breeds. They are friendly and loyal to their master or owners, yet protective. As a rule they are easily trained and adapt to showing in conformation and obedience, Any individuals lacking good terrier attitude and personality are to be faulted. A typical head unmistakably stamps the dog as being of this breed. The head is in proportion to the rest of the body. It resembles a blunt wedge when viewed from both the front and in profile. When viewed from the front, the head widens gradually from the black nose to the base of the ears in practically an unbroken line. The distance from the nose to the stop is equal to the distance from the stop to the occiput. The cheeks are flat and muscular, with the area below the eyes well-filled-in. Close-lying lips. Serious Faults: Domed skull (apple head). Flat skull. Deep, sharp stop. Shallow stop. Roman nose. Faults: Backskull or foreskull too wide. Narrow muzzle. Wide muzzle. Short muzzle. Long muzzle. Cheeks too bulgy or too flat. A full complement of strong, white teeth meeting in a scissors bite is preferred. An even bite is permissible. Loss of teeth should not be faulted for a dog of any age as long as the bite can be determined as correct. Faults: Overshot over 1/16 inch. Puppy teeth retained after one year of age. Dark in color; as dark as possible being preferred. Clear and bright, with a soft, intelligent expression. Globular, round, and somewhat prominent, yet not bulging. They are set well apart and fit well into the sockets. Faults: Light color. Too large or too small. Protruding. Squinty. Dull. Set too wide apart. Set too close together. Lack of expression. The nose is black in color. Puppies are usually born with pink colored noses, which generally turn dark before or by weaning time. Faults: Brown nose. Brownish tinge. Small pink or flesh-colored specks on nose. Pointed, inverted, V-shaped: placed well up on the sides of the head. Close together, but never touching. The inner base is on a level with the top of the skull. Always erect when alert; carried erect in motion. The size is in proportion to the size of the head and the overall size of the dog. Serious Faults: Rounded. Set too wide apart. Low-set. Too large. Too small. Flop ears. The length of the neck is approximately the same as that of the head and is in proportion to the body and size of the dog. The neck widens gradually, blending smoothly into the shoulders. The neck is clean and is slightly arched in a graceful curve. Faults: Neck too short, too thick or with loose, excess skin. Ewe neck. Goose neck. The shoulders are sloping and well laid back (approximately at a 45 degree angle); blending smoothly from neck to back. When viewed from the side, the forelegs are straight from the elbows to the feet, which point forward. When viewed from the front, the forelegs are some distance apart and drop straight from the elbows to the feet. The elbows are close and perpendicular to the body. The pasterns are strong and straight while remaining flexible. Bone size is in proportion to the size of the dog. Dewclaw removal is optional, but recommended. Faults: Straight shoulders. Loaded shoulders. Steep shoulders. Down in withers. Too far apart at withers. Out at elbows. Tied in elbows. Down in pasterns. Bowed front. In shape, the body appears square when viewed from the side, with height approximately equal to length. The height is measured from the highest point of the withers to the bottom of the front feet. The length is measured from the prosternum (front point of the shoulder forechest) to the point of the buttocks. The body is balanced and tapers slightly from the ribs to the flank, with an evident, moderate tuck up. The back is short and strong. The topline is strong, straight and firm, blending smoothly from the neck and shoulder to the tail. Serious Faults: Sloping, breaking off in rump. Narrow and/or shallow pelvis. Faults: Hind legs lacking angulation or over angulated. Hipbones above the back level. Lack of muscle in hips and thighs. Too much muscle in hips and thighs. Thighs too short or too long. Bow-hocked. Cowhocked. Straight in stifle. Over-angulated stifle. Stifles turning in or out. Legs too close together or too far apart. The feet are oval in shape and compact, with arched toes and hard, tough and well-cushioned pads. Faults: Round feet. Splayed. Flat. Feet turned in or out. Set on high and on a level with the back. Carried gaily, above the horizontal line of the back when the dog is in motion or at attention; may be dropped when the dog is at ease. Docked with approximately 2/5th of the full tail remaining; equivalent length if a bobtail. Minimum length about one inch, maximum length about three inches, for dogs six months of age or older. Serious Faults: Tail curled. Tail carried straight over the back. Set too low. Faults: Too short. Too long. Not carried gaily when in motion. A distinguishing feature of the breed, the coat is short, satiny and shiny; fine in texture and smooth to the touch. It is slightly longer at the ruff (back of neck and shoulder); uniformly covering the body. The underline, inside of front legs, and lower part of back legs are covered with at least a thin coat of hair. The skin is firm but pliable. Faults: Too long, too coarse. Dry and dull. Too thin. Loose or non-pliable skin. White and black with tan trim. Faults: A wide blaze that extends up to the eyes. Black or tan coloring, other than speckling (ticking) on the legs below the wrist joint of the forelegs or the hock joint of the hind legs. Any variation from that which is stated for the color and markings in any color combination is a fault. In a White and Tan tan markings that are too red, chocolate-shaded or brindled. In gaiting, the stifles, hocks and feet should turn neither in nor out, and the hind legs should move in line with the front legs. Overshot bite of more than 1/8 inch. Dogs of any age over seven pounds. Any dog six months of age or older weighing less than three-and-one-half pounds. Any solid-colored dog. Maltese (Blue/Grey) or chocolate markings. Any color combination in which white is not the predominant body color. Any color combination other than stated combinations. In any color combination, any dog whose head is more than half white. Any dog whose head and/or ear color and body spots are of different colors.